Have you defined what success and failure look like in your weaning program? Success might look like live, healthy calves who put on weight with minimal intervention. On the flip side, failure may be calf mortality, sick or stressed, a high rate of treatment and less weight to sell. No matter your definitions, having a plan in place can help you avoid weaning pitfalls and, ultimately, failure during a critical time frame. Make plans now to avoid these common weaning-time pitfalls. “Too often producers just go out and wean. They find a break in the weather and decide it’s time,” says Forcherio. “The ‘just do it’ mentality may work out, but much like a producer plans for breeding and calving every year, they should plan for weaning.” Develop a flexible plan at least a month in advance. Planning ahead a month gives you time to order feed, work on your health program, order vaccines and more. Part of your health program may include pre-weaning vaccines that can be administered well in advance of weaning day to boost immunity. Prepare facilities for calves trying to get back to their mothers. If calves are in a fenced area, check and reinforce fences as needed to prevent the calves from escaping. For corral areas, be sure gates are secured and without gaps. Another aspect of facilities is the environment. Small, tightly confined areas with mud are not ideal for calves. 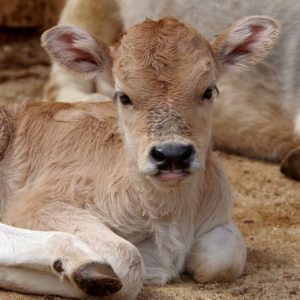 Give Calves a stress-free space with plenty of room and grass. Feed bunk placement and space are also critical. “Producers often put feed bunks in a place that convenient for them, not for their cattle,” says Forcherio. “Place feed bunks in an area where calves will run into them, not just in a place that’s convenient.” Bunks should be placed perpendicular to fence lines so calves can bump into feed as they are circling the fences. To prevent calves from competing for bunk space, provide 12 inches of bunk space for hand-fed feeds like Precon Complete Feed and six to eight inches of bunk space for self-fed feeds like Accuration Starter Complete Feed. Beyond making sure calves can find water sources and ensuring there is clean, fresh water available for all calves, another common pitfall is water accessibility. “Make sure your water trough is not too tall,” says Forcherio. “We tend to assume that 400- or 450-pound calves are going to be able to reach the same waterer set up for a 1200-pound cow when that may not be the case.” The same concept applies to hay feeders. “I often refer to hay out of reach of calves as the ‘devil’s tower of hay in the hay ring,’” says Forcherio. “The hay ring is out, and the round bale is in the hay ring, but the calves can’t reach the tower of hay in the middle.” Check your hay feeders to ensure they aren’t too tall for the shorter necks of calves. If hay is out of reach, do what you can to spread hay from the center towards the outside of the hay ring. Ask your dealer about starter feeds available through Purina All Seasons Cattle Nutrition Program. This entry was posted on Monday, July 2nd, 2018 at 4:53 pm	and is filed under articles, Cattle, News & Updates. You can follow any responses to this entry through the RSS 2.0 feed. Both comments and pings are currently closed.